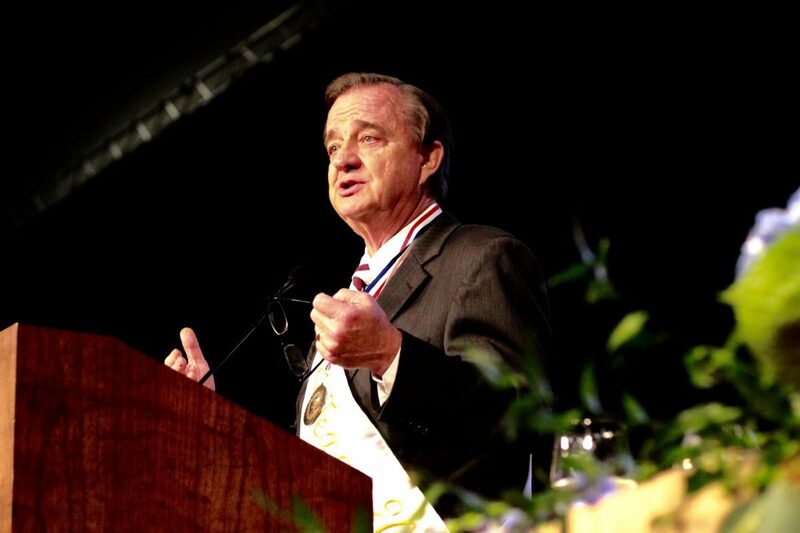 Texas A&M Chancellor, John Sharp speaks at the McAllen Convention Center on Friday, April 13, 2018. Sharp was named 2018 Border Texan of The Year. McALLEN — Soon, South Texas will begin graduating future Aggies at Texas A&M’s Higher Education Center in McAllen. This development is in large part due to the dedication and effort put forth by Texas A&M University Chancellor John Sharp. 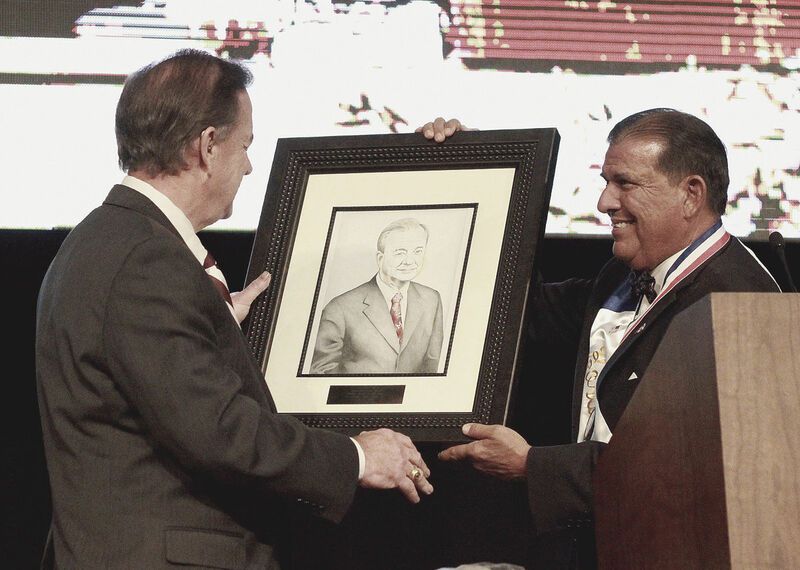 In a ceremony Friday at the McAllen Convention Center, Sharp was bestowed the honor of 2018 Border Texan of the year. Hundreds of guests filled the room for the ceremony and dinner. Proceeds from the ticket sales went toward Sharp’s organization of choice — scholarships for students at the Texas A&M Higher Education Center at McAllen. 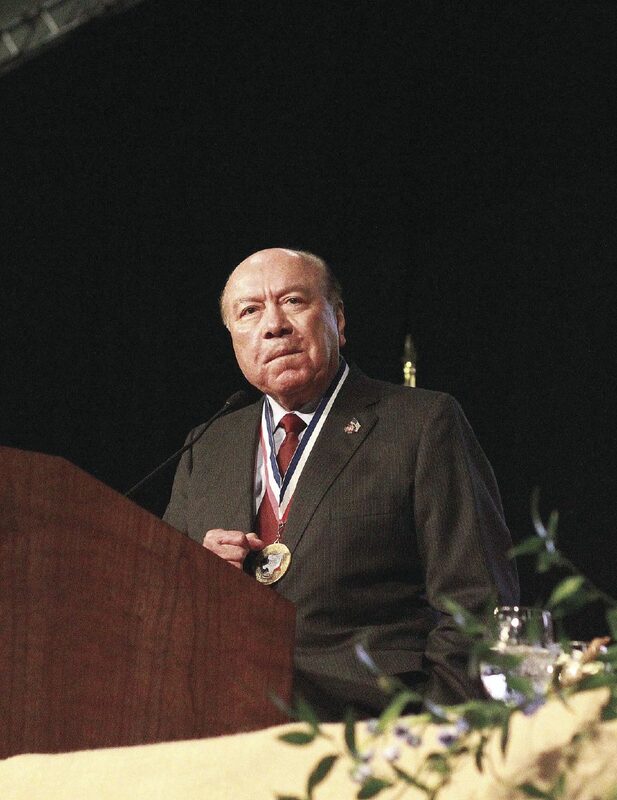 State Sen. Juan "Chuy" Hinojosa speaks at the McAllen Convention Center on Friday, April 13, 2018, before John Sharp was named 2018 Border Texan of The Year. State Sen. Eddie Lucio, D-Brownsville, gives Texas A&M Chancellor, John Sharp a gift after Sharp was named 2018 Border Texan of The Year. Mariachi Xochipilli served as the evening’s entertainment. For nearly 30 years, the award has served to honor individuals who advocate for issues affecting the Rio Grande Valley and contribute toward its betterment. Previous recipients include state Sens. Juan “Chuy” Hinojosa and Eddie Lucio, both of whom were in attendance and sat with Sharp for the presentations. The 1972 Kingsville Texas A&I graduate helped pilot the “Healthy South Texas” program and establish the Texas A&M Higher Education Center. In addition, he has spent decades in public service, from serving as student body president at his university to being elected to the Texas House of Representatives. Still, Sharp maintains the award was not meant for him. On stage, Lucio presented Sharp with a pencil portrait of the chancellor drawn by a DACA student. Throughout his speech, Sharp referred to the Rio Grande Valley as “ground zero” for economic development in Texas. “How you take care of the Rio Grande Valley is what Texas is gonna look like 20 years from now,” Sharp said.